Amongst the myriad of fanciful projects that were proposed during the later years of the war was the Ta-283. This one got farther along than most as it was actually given an RLM type number rather than keeping a project number as did most designs. 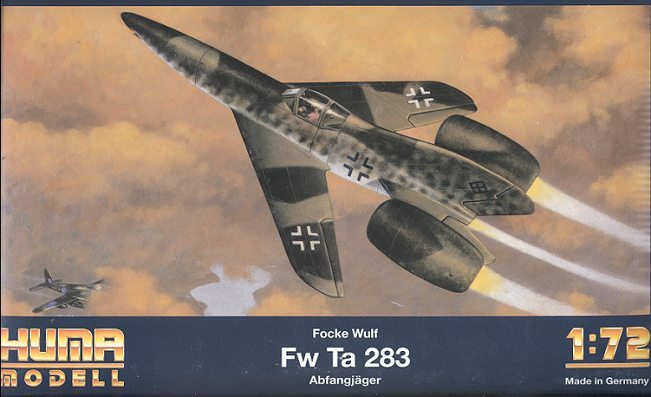 This little beauty from Focke Wulf's premier designer, Kurt Tank was to be powered by a rocket and two ram jets. Pretty heady stuff even for today. The rocket wasn't the problem as there was a reliable one as used in the Me-163, however, the ramjets were another story. Just to give you a bit of background on ramjets (also known as pulsejets). The theory is that once you get the engine up to speed, all you have to do is to dump fuel into the engine, ignite it and it will keep burning. These engines were supposed to give you prodigious amounts of thrust, making the aircraft capable of supersonic flight. However, the big problems are getting the craft up to speed and then being able to supply enough fuel as ramjets are thirsty critters. Much development was done by the Germans (who used these engines in the V-1) and postwar by the Allies, though none of the engines were ever used in a manned production aircraft. Anyway, the Ta-183 was to have these large ramjets mounted on the ends of the tailplane stubs. The pilot sat at the base of the fin, not exactly a prime spot for a fighter pilot. Armed with two 30mm Mk108 cannon, the pilot had a thousand liters of fuel between him and the guns. This fuel would be good enough for about 40 minutes of flight if sparingly used. Ramjets work best at a relatively high altitude and the Ta-183 was supposed to be able to reach 35,000 feet in a bit over two minutes. Not bad, even today. The landing gear on this aircraft were all in the fuselage, giving it an extremely narrow track. I'd bet that a lot of these aircraft would have been damaged in ground handling accidents. Nevertheless, the course of the war was such that the aircraft never reached the prototype or even the full mockup stage, and the design died. When opening the box, one initially wonders where the rest of the kit is. Huma tends to box its kits in containers that leave lots of extra room! The 35 pieces are in a nice light grey plastic with very good detail, as one expects from Huma. It is flash free with no ejector pin marks where it matters. The only sink mark is, again, in the back of the pilot. 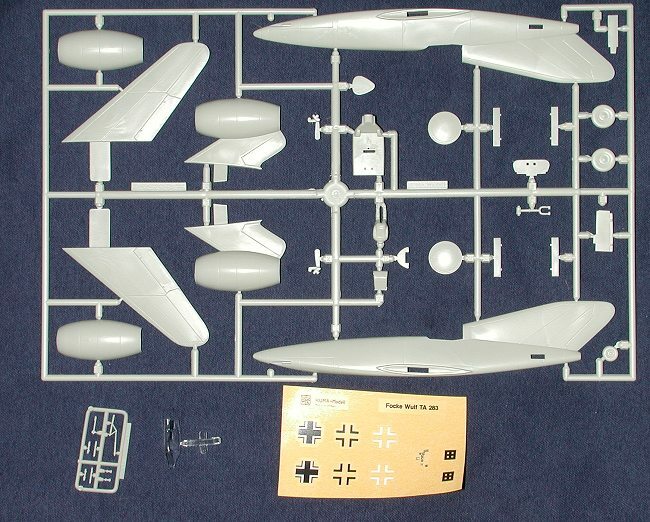 A small sprue of very finely detailed parts is also included. Again, care has to be taken to remove these parts to prevent breakage. These bits are for the interior and include the control stick and rudder pedals as well as some landing gear linkages. Instructions are adequate to complete the kit. There is a full color camouflage three view showing this to be painted in a splinter pattern of RLM 81 and 82 upper surface with RLM 76 lowers. The instructions themselves give no color information other than the camo pattern. There are five construction steps and they are logically arranged. This kit will be very tail heavy so you do need to put in a bunch of weight as far forward as you can. As with several other Huma fighters, this one has one piece wings and tailplanes, helping to ease construction of these parts. The decal sheet is again a very generic one with just insignia, an instrument panel decal and those odd squares. The decal spares box will be needed for swastikas. Overall, it looks like another very nice and relatively quick building model. Review kit courtesy of me and my wallet! If you would like your product reviewed fairly and quickly by a site that has over 1,700 visits a day, please contact me or see other details in the Note to Contributors.